They also don’t break into song, which differentiates them from the critters in The Lion King, the later Disney flick that most resembles Bambi. Not only do both feature moderately-anthropomorphized animals in their natural habitats, but also they present virtually identical opening and closing sequences. I’d not seen Bambi for a few years, so I’d forgotten just how heavily the beginning and ending bits of Lion King “borrow” from it. 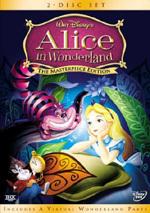 Bambi appears in an aspect ratio of 1.33:1 on this single-sided, double-layered DVD; due to those dimensions, the image has not been enhanced for 16X9 televisions. Bambi received excellent treatment on this DVD, as the transfer presented it well. Across the board, sharpness seemed strong. The movie never suffered from any undue softness. Instead, it looked appropriately well-defined and distinctive. I saw no issues with jagged edges or shimmering, and I also noticed no edge enhancement. 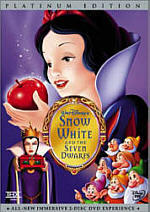 Despite the movie’s advanced age, it displayed no source defects. The film lacked any specks, marks or other flaws, as it always stayed clean and fresh. As one might expect from a flick that takes place in a forest setting, Bambi stayed with a naturalistic palette, and a fairly subdued one at that. The movie used restrained tones that looked full and rich here. They didn’t exactly leap off the screen, but they weren’t intended to do so, and the DVD reproduced the colors well. Blacks also seemed dense and deep, while shadows were appropriately thick but not overly dark. Ultimately, Bambi looked very good. I also felt satisfied with the Dolby Digital 5.1 soundtrack of Bambi. Oddly, the folks at Disney dubbed this an “Enhanced Home Theater Mix”. That appellation made more sense for the reworkings accorded flicks like Aladdin and The Lion King; those movies theatrical releases had 5.1 tracks, so the “Enhanced Home Theater” versions made a few changes. However, Bambi was always mono in the past; it never had a theatrical 5.1 edition, so there’s no reason to call this one “Enhanced Home Theater” other than marketing, I suppose. In any case, I found the new mix to offer a tasteful expansion of the original monaural. The track didn’t exactly go nuts with ambition. Most of the audio remained oriented toward the center channel. Music showed the most activity, as the songs and score gently emanated from the sides and rears at times. They stayed in the middle for the most part, though, and the effects came from the same realm. A few elements like thunder and gunfire popped up in the sides, but that was about it. The track largely stuck with it is one-channel roots. As for quality, the audio sounded quite good given its age. Speech was slightly thin but usually appeared surprisingly full and natural. I noticed no issues with intelligibility or edginess and thought the lines came across well. Effects demonstrated moderate dimensionality and kicked in decent low-end response for some of the louder elements. Music also showed somewhat surprising range, as the highs were acceptably vivid and the lows demonstrated pretty solid presence. A little hiss appeared throughout the film but I noticed no source flaws or noise. This wasn’t a stunning track, but it was definitely above average for a movie from 1942. As a “Platinum Edition”, Bambi comes with many supplements across its two discs. Only one substantial extra shows up on DVD One: Bambi: Inside Walt’s Story Meetings. Hosted by Patrick Stewart, this 70-minute and 24-second piece acts as a form of audio commentary. It takes transcripts from story meetings for the film and has voice actors re-enact the remarks made by a mix of participants. We hear from Disney, story director Perce Pearce, consultant Don Graham, story developers Harold Miles, Bill Cottrell and Ted Sears, artistic consultant Sidney Franklin, animal anatomy consultant Rico Lebrun, supervising animators Eric Larson, Frank Thomas, story adaptor Larry Morey, story developer Ben Sharpsteen, supervising director David Hand, art director Thomas H. Codrick, sequence directors James Algar and Samuel Armstrong, story artist Joe Grant, animator Marc Davis, and supervising animator Milt Kahl. “Meetings” essentially follows the elements of the movie in the order they appear on screen. We hear issues related to the graphic depiction of the forest and recreating animals, liberties taken with the source novel and storytelling concerns, character development, cinematic techniques, casting and vocal characterizations, musical themes and sound design, choices for character names, animation styles and choices, conveying the change of seasons and new personalities, the depiction of Bambi falling in love, the use of color in his fight, how much of “man” to show, and structuring the climactic hunt/fire. In addition to the comments, we see movie clips, development materials and sketches, and a few other useful snippets. For example, when Walt refers to a Pluto short used as an influence, we get to check out that clip compared to the shot from Bambi. We also watch rough animation and research footage. As the DVD starts, we encounter a mix of ads. We find trailers for Cinderella, Chicken Little, Bambi and the Great Prince of the Forest, and Lilo & Stitch: Stitch Has a Glitch. These also appear in the disc’s Sneak Peeks domain along with promos for JoJo’s Circus, Growing Up With Winnie the Pooh, the Disney Princess line of DVDs, The Cat Returns, Porco Rosso and Nausicaa. When we shift to DVD Two, we begin with a pair of deleted scenes. This area includes “Winter Grass” (38 seconds) and “Bambi’s First Snow” (two minutes, 32 seconds). Animator Andreas Deja introduces the clips with a quick comment about what to expect. Neither presents any form of animation. Instead, they come as story reels, which are filmed storyboards accompanied by dialogue and music. Neither seems scintillating, but they’re fun to see. “Snow” is the more amusing of the pair; it seems unnecessary, though, as the existing winter fun sequence works better. Five pieces appear inside the “Games & Activities” area. The Forest Adventure has you guide Thumper and Owl through the woods and participate in a mix of activities along the way. This includes a memory contest, a counting task, and trivia questions. All are meant for wee ones and remain simple. 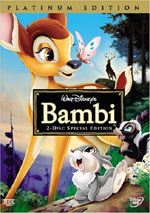 A recurring feature on Disney DVDs, the DisneyPedia lets us learn about “Bambi’s Forest Friends”. This one takes the format of a four-minute and 13-second featurette. It lets us know facts about fawns, rabbits, skunks, and owls. Though the information remains basic, it’s a fun program since we get to see some nice shots of real animals. In a “Personality Profile” called What’s Your Season?, you take a quiz. This asks questions that decide which season best represents you. Apparently I’m a fall person: “thoughtful, caring and friendly”. Ha! Disney’s Storytime presents a tale called “Thumper Goes Exploring”. As usual, you can read it yourself or follow along with it as narrated by Owl. Kids should enjoy it. For the last part of “Games & Activities”, we discover a Virtual Forest. This reminds me of those artificial fireplaces you could run on your TV. It shows a forest scene that gradually changes to illustrate different weather conditions. The clip lasts three minutes and doesn’t seem terribly useful or interesting. When we head to the “Backstage Disney” area, we locate nine different components. First comes a documentary entitled The Making of Bambi: A Prince Is Born. In this 53-minute and 20-second program, we find the usual complement of movie clips, archival materials, and interviews. We get notes from author/film historian John Culhane, Disney producer Don Hahn, Pixar Director and Executive Vice President John Lasseter, animator Andreas Deja, story developer Mel Shaw, author/historian Paul F. Anderson, animation historian Charles Solomon, environmental historian Dr. Ralph H. Lutts, clinical psychologist Dr. Maxine Harris, story artist Joe Grant, supervising animators Eric Larson, Ollie Johnston, Frank Thomas and Milt Kahl, animator Marc Davis, supervising animator Milt Kahl, Disney art director Ric Sluiter, background artists Rob McIntosh and Tyrus Wong, Disney Feature Animation director Aaron Blaise, Disney Feature Animation art director Cristy Maltese, Disney Toon Studios animation director Dave Bossert, animation art historian Ron Barbagallo, film historian Miles Kreuger, composer/author Ross Care, conductor John Mauceri, and actors Peter C. Behn, Donald R. Dunagan, and Cammie King Conlon. We take a look at the movie’s transfer in Restoring Bambi. Hosted by Patrick Stewart, the five-minute and 56-second featurette presents comparison clips and comments from Disney Toon Studios animation director Dave Bossert, Library of Congress nitrate film vault leader George Willeman, Technology, Mastering and Library Restoration directors Steve Poehlein and Theo Gluck, Lowry Digital Images CEO and founder John Lowry, and digital color timing supervisor Bruce Tauscher. “Restoring” offers basic details of the various processes used to bring the picture and audio of Bambi up to snuff. It mostly seems to exist to pat those involved on the back, as it doesn’t provide a very illuminating examination of film restoration. DVD One includes the trailer for upcoming sequel Bambi and the Great Prince of the Forest. DVD Two goes into that flick in more detail via The Legacy Continues: A Sneak Peek at the All-New Bambi Movie. This four-minute and 48-second featurette shows archival materials, snippets from both films, and comments from animation consultant Andreas Deja, producer Jim Ballantine, director Brian Pimental, character lead/animation supervisor Pieter Lommerse, animation director Alexs Stadermann, and actor Patrick Stewart. They talk about the inspiration for the new story, where it takes place in the original’s chronology, attempts to make it look as good as the first flick and some story points. Not surprisingly, it mainly exists to promote the sequel, and it doesn’t provide much of interest. For a glimpse of the era in which Bambi appeared, we head to Disney Time Capsule: 1942. This four-minute and 45-second featurette tells us about world events at the time - with an emphasis on World War II - as well as popular movies, music, and other entertainment. Much of the clip concentrates on activities at Disney, as we see the studio’s response to the war and the production of Bambi. It also tells us about the year’s cost of living, fashions, sports, and births of significant folks. It’s a quick and fun synopsis of society circa 1942. A collection of stills, The Art of Bambi can be viewed either of two ways. We can flit through it as a traditional stillframe gallery, or we can watch it as a slideshow. The latter offers the option of “docent audio”. For 39 of the stills, we get narration that provides a little information. We hear about subjects like changes from book to movie, the artists and their careers, and specifics of the film’s visual developments. The comments range from basic to insightful, and they’re a nice addition to the set. This area breaks into four sections: “Concept Art” (52 stills), “Story Sketches” (37), “Color Keys and Backgrounds” (35), “Posters” (5), “Production Stills” (18) and “Character Design”. The latter then splits into “Bambi” (24), “Bambi’s Mother and Father” (9), “Flower” (6), “Friend Owl” (15), “Faline” (5) and “Thumper” (8). Note that if you choose to watch these with “docent audio”, you don’t get access to a few of the collections. The “docent” domain loses “Posters”, “Production Stills”, “Flower” and “Faline”. Whichever method you select, you’ll find a lot of good art here. We get basic conceptual work as well as more polished sketches, and both let us see the evolution of the material. I always enjoy these collections of art, and this is another good one. Does animation get any better than Bambi? Nope. Do animated films get more entertaining? Yup, but Bambi remains a delight nonetheless. The DVD offers excellent picture quality along with very good audio and a strong complement of extras highlighted by an insightful look inside the film’s preparation meetings. One of the all-time great films, I highly recommend this excellent DVD.